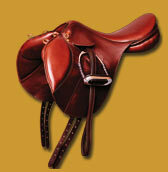 Horse Country designed the Le Chamois saddle to give riders many of the benefits of the popular (and expensive!) French saddles at a more realistic price. Made on a French tree with shorter points, a medium tree Le Chamois will fit many horses without the need for special pads. Its balance point, just behind the pommel, is perfect for the show ring, permitting the rider to maintain a proper forward seat position effortlessly. Small knee blocks below a padded hide flap give the rider extra security while its movable/removable thigh block allows customization to each individual rider's needs. Durable, smooth bridle finish English leather has been used throughout to ensure that your Le Chamois saddle will look good for many years to come. Each saddle comes with a signature chamois cloth. Test saddles are available. Please call Horse Country for our current available stock. The Flyover saddle has a unique design that allows the rider to feel closer to the horse than ever before. Made by Jeffries in England with the help of Olympic 3-Day star Ian Stark, the Flyover's unique titanium tree helps the saddle weigh in at less than 8 lbs, lighter than any other cross-country saddle. It allows the horse absolute freedom of shoulder movement and seats the rider directly behind the withers so the rider's leg stays effortlessly in the pocket created by the horse's shoulder and barrel. By using a short style girth, all bulk is removed from under the rider's leg, allowing much better communication between horse and rider. Horse Country offers two Flyovers. The original Flyover is made of a specially treated leather that makes it water and sweat resistant so water obstacles, rain and lather no longer mean hours of after riding care. Its newest version is offered in super soft French leather. The Flyover cleans up quickly and the leather will not dry out and crack. Whether you foxhunt, event or trail ride, you will find the Flyover to be a comfortable saddle that gives you plenty of security in the field and on the hills.